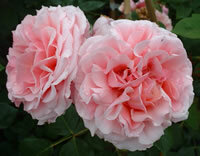 The rose Aloha was first bred in the United States in 1949 by Eugene Boerner. Eugene worked for Jackson & Perkins for many years as their Director of Research before passing away in 1966. 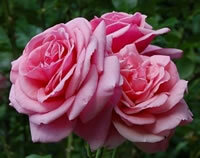 He created the Aloha by crossing the Mercedes Gallart rose with the popular New Dawn climbing rose. The result was a gorgeous hybrid tea climbing rose that produces large, stunning pink roses again a backdrop of dark and glossy green leaves. Aloha roses will grow to be about 8 to 10 feet tall with a spread of anywhere from 4 to 8 feet across. The blooms on this plant are humungous, averaging 5 inches in diameter with a ton of petals on each bloom, as many as 55 each! These old-fashioned blooms will form in small clusters on the plant over the course of the entire growing season. The rose Aloha is hardy in zones 5 through 9 and is often grown next to homes and patios because of its strong fragrance that smells a lot like apples. The Aloha also makes a great cut flower and can really add beauty to just about any bouquet. The rose Aloha is a moderate sized climbing rose which means it is a little more versatile than its larger cousins. This is a great rose for growing up pillars or arbors, when you don't want to deal with having to prune back long canes each year. The great fragrance of this rose also makes it a good choice for planting next to your home, especially nearby a window that you might frequently keep open during the warmer months of the year. Imagine how great that apple scent would be drifting through your home on a nice summer day! 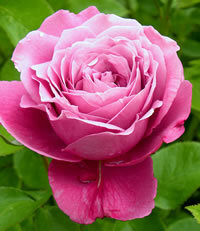 Aloha roses are also tolerant of partial shade, which even adds to their versatility. It should be noted however that no matter how tolerate roses are of shady spot, they will rarely ever perform as well in these locations, as they would if planted in full sun. At a minimum you should be looking for a spot that gets at least 6 to 8 hours each day of direct sun light. Even more preferable are the locations that get the full morning sun, as this helps burn away the dew early in the day and keeps the leaves of your rose Aloha dry and healthy. Planting the rose Aloha is pretty easy and depends in part on how you purchased the plant. Before you do any digging however, I always suggest to gardeners that they take a trip to their local garden center and pick up a bag of a good organic compost (assuming they don't make their own). When you dig your hole, mix in the compost with the loose soil at a ratio of 1 part compost for every 2 parts soil. This stuff works wonders and roses absolutely love it. If you bought your Aloha roses from a local nursery, then there's a good chance they were already established in a container. These are the easiest to plant. Dig yourself a hole that is at least twice the diameter of the plant, and equally as deep. This will give you plenty of room around the root ball for your new soil mix, while still keeping the bud union at the same depth it was in the container. If you bought your rose Aloha online, then they probably shipped it to you as a bareroot plant. These may look intimidating, but they aren't hard to plant either. You should start by soaking the plant overnight in a bucket of lukewarm water prior to planting day. This will help rehydrate the roots. Then dig a hole that is as wide as the longest roots, and deep enough for you to set the rose atop a mound of soil in the center of the hole, and keep the bud union about an inch or two below the surface. Set your rose Aloha in place on top of the mound and then spread the roots out in all directions. Back fill the hole about halfway to start and then take the garden hose and water the loose soil heavily until it flows like mud around the roots. You can then go ahead and fill the hole the rest of the way with soil. Give it one more heavy watering and top off any final settling that may have occurred. It is also suggested that you mound up some soil or mulch around the exposed canes of a bareroot plant, until new growth forms. Then you can remove the mound back down to ground level. This helps prevent the canes from drying out while the new roots are forming. Taking care of the rose Aloha is pretty straight forward if you follow basic rose care maintenance. You need to make sure that you supply your plant with adequate water, but also make sure that the roots are not sitting in damp soil constantly. Roses in general are very susceptible to diseases if not grown in soil that drains well. A good rule of thumb is to give your roses one deep watering every week. If you live in a hot or dry region, you may need to step that up to every 4 to 5 days. You should also give your Aloha roses a dose of an all-purpose granular fertilizer in early spring when the leaves start to form. Since this is a repeat bloomer, it will benefit greatly from additional feedings over the rest of the growing season as well. I usually will give my roses a second feeding right before the first big bloom, and then a third one around the middle of the summer to encourage late season blooms. 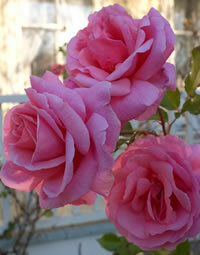 You should prune your rose Aloha in early spring before the leaves start to bud. This makes it much easier to see what you are doing. Start by removing all the dead growth, as well as any canes that may look discolored from disease. Next, cut back any overlapping lateral canes, as these will compete for sun light once the leaves fully open. 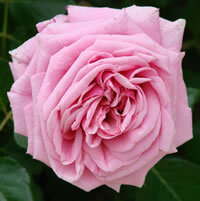 Lastly, give your climbing rose a light pruning for shape, and to encourage new growth. This is also a good time to rake up around the base of your rose Aloha and clean up all the dead leaves and debris that may have collected there. Throw this material away in the trash, along with your cuttings. Never let decaying matter lay around the base of your roses as this can become a breeding ground for certain pests and diseases. I always finish up by giving my roses a fresh layer of mulch to start the new growing season.